In this dramatic re-enactment video, Officer Mario Gutierrez of the Miami-Dade Police Department shares his story of stopping a man from blowing up a gas station at Miami International Airport, while sustaining multiple stab wounds in an attack by the subject. Officer Mario Gutierrez, an officer in the Miami-Dade Police Department for more than 22 years, received the 2014 FSA’s “Law Enforcement Officer of the Year” award for his heroic efforts in this incident. On October 29, 2013, Officer Mario Gutierrez was working his normal traffic detail near the Miami International Airport when he noticed smoke coming from a Shell gas station nearby. As he approached, Gutierrez saw a man, later identified as Dominique Jean, stuffing flaming wads of paper into the open cover of one of the station’s underground fuel tanks. The suspect then took one of the fuel hoses and attempted to add more gas in order to blow up the station. Officer Gutierrez quickly approached the gas pumps and pressed the emergency shut-off button. At this point, the suspect made an aggressive move toward the approaching officer, forcing Gutierrez to use his Taser, but the perpetrator was unfazed by the electricity coursing through his body. He lunged at Gutierrez with a large knife, cutting his arm. Gutierrez’s years of defensive training and instinct kicked in and he wrestled the knife out of the suspect’s hands and turned it on him, stabbing him three times. This criminal was undaunted. He got up, grabbed a large screwdriver and attacked Officer Gutierrez again; he mounted the officer from behind in an attempt to stab one of Miami’s finest. That’s when he reached for the officer’s gun. At this point, Officer Gutierrez had to wrestle for his own sidearm, while images of his family flashed through his mind. As he tried to gain control, the suspect bit the hand that was grasping the firearm, nearly taking off Gutierrez’s thumb. Feeling no pain, Officer Gutierrez quickly gained control of the gun and fired two shots, one to the shoulder and one to the chest. He then extended his arms and fired three more shots center mass. The suspect was dead and the attempt to blow up the airport gas station had been thwarted, but the fight was not over for Officer Mario Gutierrez. As he reached for his radio he could barely see the screen, and after several attempts he was finally able to connect for help. Not knowing the extent of his own injuries, Gutierrez rose to his knees as his fellow officers arrived to rush him to the hospital. Even in his weakened state, his first instinct was to warn his brothers in arms that there was still fire near the fuel tanks. Officer Juan Leon rushed him to the hospital, the thoughts of family and duty still on his mind; Gutierrez apprised Leon of the situation, and then asked him to tell his family that he loves them. 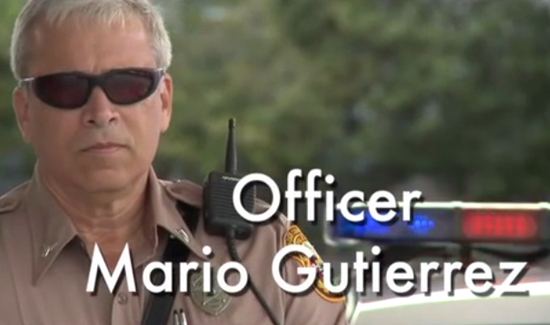 Miami trauma doctors saved Officer Mario Gutierrez’s life; Officer Gutierrez saved countless others.